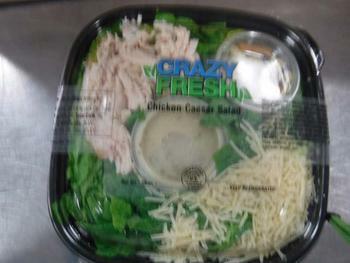 Russ Davis Wholesale – Crazy-Fresh of Eagan, Minn., is recalling approximately 702 pounds of chicken Caesar salad. The products contain milk and anchovies, allergens not declared on the label. The recalled products, bearing establishment number “P-45204” inside the USDA mark of inspection, were shipped to retail locations in Iowa, Michigan, Minnesota, Montana, Nebraska, North Dakota, South Dakota, Wisconsin and Wyoming. Consumers with questions about the recall may contact the company at (877) 433-2173.